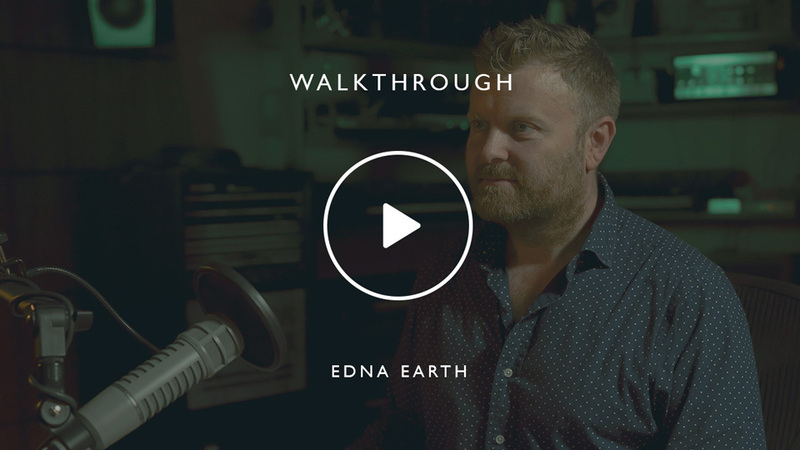 An epic collection of synthesised orchestral sounds, eDNA Earth has been created using our enormous range of organic orchestral recordings, manipulated, warped and reprogrammed beyond recognition by Spitfire’s award-winning team of composers, engineers and developers. With thousands of sounds and presets, we have taken our entire orchestral palette and morphed it into an alternate universe. 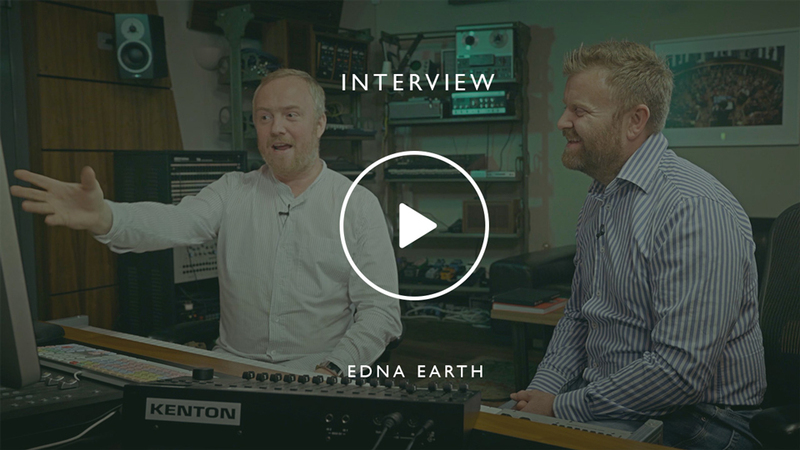 A powerful encyclopaedia of unique, experimental electronic samples, eDNA Earth has been created with film, TV and games music in mind, offering endless inspiration to the next generation of media composers, while also appealing to dance and pop producers wanting to add cutting-edge, cinematic electronic textures to their music. 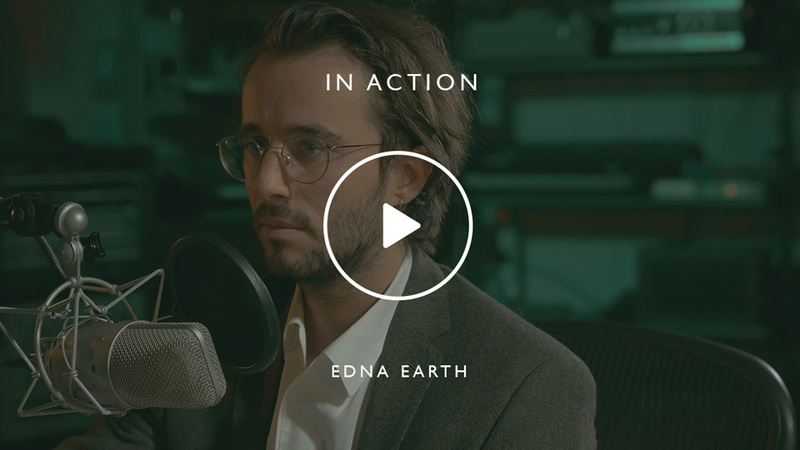 With eDNA’s new easy to use, ultra-controllable GUI, an uncharted territory of new sonic experimentation is within your grasp. 29.0 GB download size Too large to download? Choose hard drive delivery at checkout. 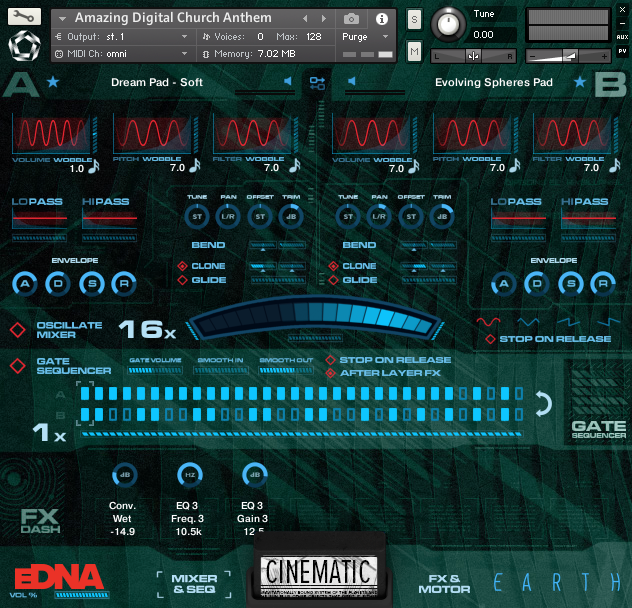 eDNA Earth is a collection of 1900+ basic instruments, mangled into over 1000 custom presets by the Spitfire team, over a period of six months. The eDNA Engine, housed in an attractive, intuitive GUI, is designed for a wide range of genres and cinematic settings, allowing you to create and expand your own cinematic universe. Select by type of sound — Atmos, Drones and Scapes, Keys, Bass, Drums and Percussion, FX, Leads, Pads and Strings, Sequences and Plucks or Synthetic Orchestra — and play, play, play. Such is the depth of content here, that if you were to play each sound for 30 seconds, it would take you 15 hours to listen to every instrument and patch. The organic source material has been taken from our most renowned libraries, including Albion ONE and Spitfire Symphonic Orchestra, recorded at the world’s best recording studios including Air, Lyndhurst Hall. These textures are easy to layer and mix with acoustic recordings and live orchestras, allowing you to realise epic, devastating fusions of electronic and acoustic sounds and add an experimental dimension to your composition. From gritty urban drama, sci-fi, epic action and game music, to contemporary EDM and dance, the sheer amount of sounds and presets make it extremely versatile, enabling you to create entirely unique soundscapes. For those new to synth programming we have over 1000+ spring-out-of-the-box presets, and for those who love to spend hours tweaking sounds, you have the ability to mangle, affect and create your own presets. This is not about the music of now or yesterday - this is a whole new soundscape, adding an extra dimension to your compositions - from lush, expansive ethereal pads to jarring, dystopian, atonal sound effects. If you are looking for timeless cinematic textures that go far beyond orchestral domains, this vast array of ultra-controllable sounds will keep your other-worldly desires sated for many years to come. We have spent the last ten years building the finest collection of strings, brass, woodwinds and percussion libraries. But throughout this period, we have also been harbouring a deeper ambition. As award-winning composers, Spitfire Audio founders Paul Thomson and Christian Henson struggled with mixing synthesised sounds in with orchestral, organic instruments they used when writing music to picture. When working on the Stephenson’s range from Spitfire’s popular Albion range, they found that if sounds are warped from organic sources, they sat in with organic material more effectively, even if the warped sound no longer resembled its original source material. Following on from the success of the Albion range, Spitfire set about creating this new world of sound. As many of us here at Spitfire come from the first wave of 90s dance music and experimental cinematic composition, we were aching to mess with our orchestral sample recordings and turn them into something new. For years we kept a depository of the best of them, on a secret hard drive, a set of polished diamonds, ready to be manipulated and skewed to create the ultimate in electronic raw materials. Since the dawn of Spitfire, we have experimented with orchestral warping. We set about finding the most rarefied analogue outboard equipment, synths, filters, gates and verbs and commissioned and created a set of bespoke digital signal paths. At regular points over the years, we took our secret hard drive out of its cupboard, pulled the sounds up and fed them through these multi-stage signal paths. We often left them simmering overnight, creating the most deliciously dark, wrong-sounding set of synthetic sounds. During the warp stage, we created well over a terabyte of data. 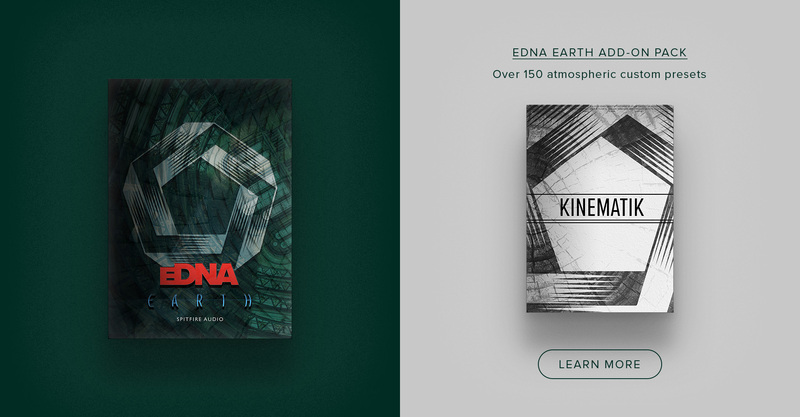 Our team then set about selecting and honing the very best of the best to create a collection of multi-sampled sound sets — the foundations of eDNA Earth. Imagine the eDNA engine as a set of two turntables and a highly sophisticated DJ mixer. It contains two sound bays, with individual and independent modulators, control of trim, bend, glide, cloning, tuning, ADSR, LPFs, HPFs and wobbles that modulate pitch, volume and filters. The onboard gate sequencer allows independent gating between these two bays and unified control of amount, shape, speed and length of sequence. These two signals are then at last unified with a DJ style x-fader. Move between the sounds with the mouse or the factory-default assigned modulation wheel. But it doesn't stop there. We've designed a custom script that oscillates the x-fader automatically with control over speed and phase. Last but not least is eDNA's five-stage FX path with 34 custom plugins (including a bunch of bespoke IRs) pre-loaded. There are two "layer fx" stages that effect sound A or B. A "motorised" FX stage that can either effect A, B or both, and a master FX stage that affects the entire output. Finally, an auxiliary FX stage that can be sent via the layers or master FX stage. Any parameter of these can be assigned for automation or assignment to your controller. Our award-winning team of composers, engineers and producers spent six months wrestling eDNA Earth's 1900+ organic sounds into an awesome array of 1000+ eDNA presets — from beautifully refined dynamic MW x-fades, to turbo-charged tempo synced, gated, phased wonders. 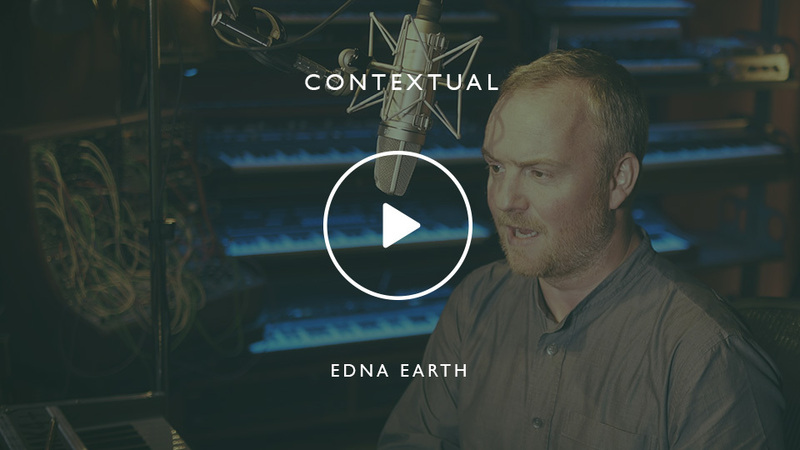 The eDNA engine is made up of seven cartridges, each curated by a different composer or engineer, each of them focusing on a distinct sonic style. We have organised the presets by type of sound, but you can also browse by cartridge, using Komplete Kontrol or Maschine. DARK: A series of chaotic, frenzied, dystopian sounds, from searing leads to super fat basses and eerie, atmospheric pads. Suitable for the grittier end of dance music, this set of sounds will also add edge to hybrid blockbuster and trailer work. CINEMATIC: Modern hybrid synths for the big screen, curated by multi-award-winning composer Christian Henson. RETRO: Mainstream zeitgeist synths and patterns by sonic wizard Stanley Gabriel, adding an extra dimension to pop and dance music. TRANCE: EDM classics and next-generation dance, rhythmic synths and epic drops, taking you on a journey from quirky 8-bit and vintage game console sounds, through to ambient techno and minimal house. ANALOGUE: Digital vs Analogue synth battles, made using Christian Henson's enormous, rarefied vintage synthesizer collection of Junos, Jupiters, MS20's and Moogs, creating a whole new world of sonic opportunities. BROKEN: Pseudo-organic x-fades, pads, atmos, drones & fx, curated by Harnek Mudhar, a Spitfire engineer with his finger on the zeitgeist. Broken operates in the hinterland between organic orchestral material and raw synth sounds — almost like earthly instruments, but slightly warped. WARPED: An ever-changing landscape — hold a sound down and move the modulation wheel very slowly. Every sound here is programmed to morph beyond all recognition via vibrant shimmering paths. This view allows you to control 32 different FX across each sound. It also gives you access to the master mix and aux sends, plus has a unique motor FX that allows auto-modulation of your sounds. 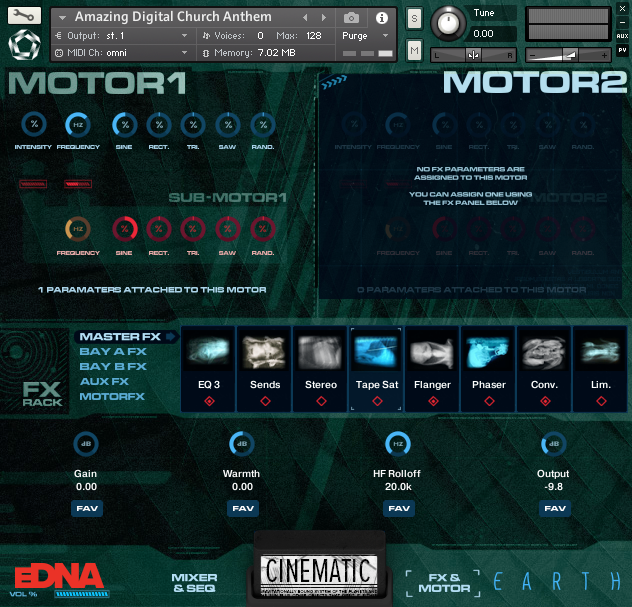 Contains each preset with ability to change to other sounds within Earth.